Mark Ramprakash has been dropped by Surrey for their next County Championship match against Somerset following a poor start to the season which cumulated in a pair against Worcestershire last week. Ramprakash, 42, has scored 62 runs in eight Championship innings and his pair at New Road, completed when he was caught down the leg side off Richard Jones as he was out twice in a day, was just the third of his first-class career. 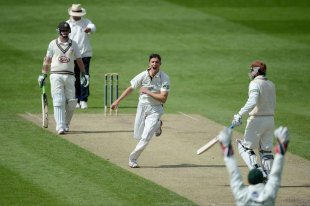 Chris Adams, the Surrey cricket manager, said it was not a decision he took lightly. "We have not selected Mark Ramprakash for the game against Somerset which was a very difficult decision to make," he said. "Mark has had a tough start to the season and has not made the impact with the bat that he would have wanted to. "But you do not score the amount of runs that Mark has without knowing your own game and I know he will work hard to find his form again. The challenge now for Mark is to push hard to regain his place for the remainder of the season." The difficult start to this season followed a 2011 campaign that was also below Ramprakash's usual high standards. He was hindered by injury during the year and made 700 runs at 33.33 in 13 Championship matches with one hundred.